We are pleased to announce that Tim Kuppler has joined our leadership team as Director of Culture and Organization Development, bringing 25 years of experience in strategy, culture, and performance improvement to this new position. As a performance culture specialist, Tim founded CultureUniversity.com, dedicated to positively impacting society through organizational culture education, awareness, and action. 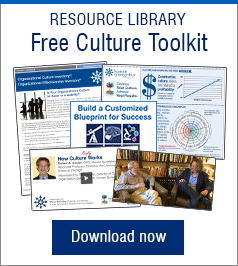 He authored Build the Culture Advantage, Deliver Sustainable Performance with Clarity and Speed (2014), which features a framework and roadmap for developing a performance culture. Tim previously served as President and Senior Consultant for Denison Consulting and held senior leadership positions in large automotive organizations, in which he successfully directed major culture transformations. Tim’s rare mix of extensive operations and consulting experience promises to propel us forward in achieving our mission of Changing the World—One Organization at a Time®.